I was the only civilian to be killed during the battle. This is where I was born and lived most of my life. Were were not living here at the time of the battle as we had moved to Breckenridge Street. I was killed at my sister Georgia's house on Cemetery Hill. She had a new little baby and I went there with my mother to care for her and her newborn son. The fighting was terrible and it was very dangerous, but we were determined to do our part to keep our soldiers fed during the battle. On July 3, a bullet went through two doors and struck me in the back, killing me instantly. display on the window to the right of the door with the building number showing above. 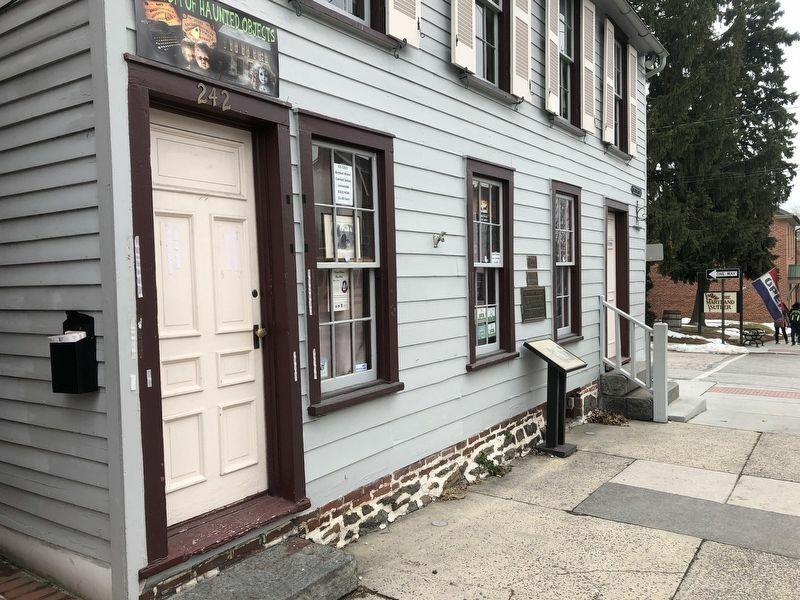 Marker is at or near this postal address: 242 Baltimore Street, Gettysburg PA 17325, United States of America. Touch for directions. Other nearby markers. At least 8 other markers are within walking distance of this marker. Mary Virginia Wade (a few steps from this marker); Jennie Wade Birthplace (a few steps from this marker); 223 Baltimore Street (within shouting distance of this marker); 267 Baltimore St. (within shouting distance of this marker); Mary Witherow (about 300 feet away, measured in a direct line); “I can see them yet . . . ” (about 300 feet away); Matilda June "Tillie" Pierce (about 300 feet away); Temples of Mercy (about 300 feet away). Touch for a list and map of all markers in Gettysburg. More. 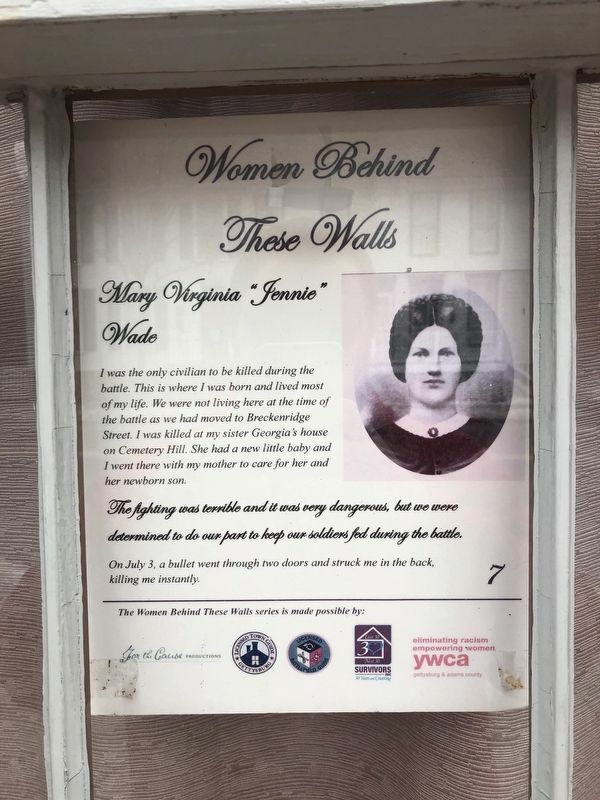 Search the internet for Mary Virginia "Jennie" Wade. Credits. This page was last revised on February 25, 2019. This page originally submitted on February 24, 2019, by Devry Becker Jones of Washington, District of Columbia. This page has been viewed 31 times since then. Photos: 1, 2. submitted on February 24, 2019, by Devry Becker Jones of Washington, District of Columbia. • Bernard Fisher was the editor who published this page.